Enumclaw Fire Department was founded in 1903 after a commercial fire tore through businesses and homes destroying a large section of the community. On November 17th, 1903, the Enumclaw Fire Department was organized. Samuel Lafromboise was nominated as the first Chief. He served from 1903-1918. L.A. Dibley was the first assistant chief, J.A. McKinnon was the second assistant chief; E.F. Eckhart stood as treasurer, and Paul Jensen was secretary. A week after the start of EFD, the businessmen of Enumclaw “chipped in” and bought 500ft of 2-inch hose to go with the 2 hose carts that the men pulled through town to a fire. At this time the only method of spreading the news of a fire was either in person or by telephone. At a formal dedication ceremony, on April 7th, 1905, an alarm bell was placed in the tower in the city park. It was christened “The Sentinel” by Miss Marjorie Fahey. It was said that every man, woman, and child in town attended. In 1909 the FD was incorporated under the laws of Washington State and in 1918 was finally turned over to the Enumclaw City Council to be governed. May 3rd, 1921 was a great day in the history of EFD. The department purchased a 1921 Model T Fire Truck from the Collins Motor Co. The cost of the equipment, manufactured by the Northern Apparatus Co. of Minneapolis, was $2,390.00 and consisted of a hose body and a 40 gallon chemical tank. Adding still further to the efficiency of the department, a siren was installed, next to the bell, in 1923 for $650.00. A lungmotor was purchased in 1931 at the cost of $225.00. The lungmotor was an early resuscitation device for forcing air into the lungs i.e. ; in a respiratory arrest patient. 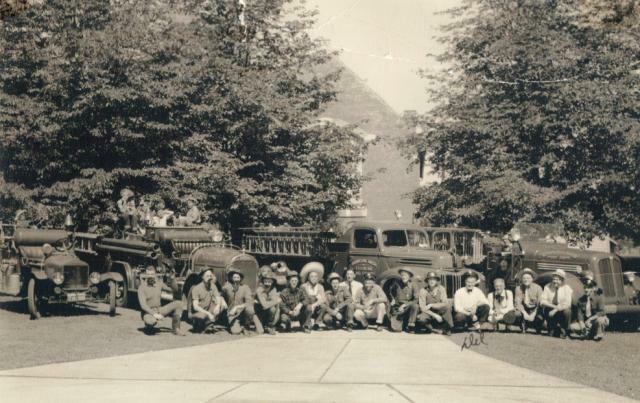 In 1946 the King County Fire District was formed. The first commissioners were also were local businessmen that worked toward the county adopting the Fire District. They were Hugh Kincade, Fred Armstrong, and Ira Baker. As time moved on, it became apparent that the FD a larger building than City Hall, where they currently had their headquarters. In 1967 the process of building a new fire station was moved into action. The new fire station was completed in the fall of 1968 for $169,000.00. It had 4 bays that were pull-through from the alley. Each bay door was glass, top to bottom. The Fire Station was named in honor of former Chief, Guy Lafromboise. In 1979 the first aid unit was put into service. The City bought the unit for $1.00 from Dwight Garrett. It was a 1979 Ford van that served the community until it was donated back to him sometime in the 90’s. 2011 was a busy year. Along with being annexed into King County Fire District 28, EFD also hired on 6 more full time, career staff, allowing each of the 3 shifts a minimum staffing of 4, 24/7, as per NFPA Standards. EFD, with guidance of Chief Joe Clow, began all BLS transports in July of 2011 to help with the continuity of patient care and to bring in further revenue to support the funding to pay for the new career staffing.